Bad news for iPhone owners: According to industry reports, the oft-glitchy Apple iMessage service is becoming a favorite tool of spammers, now accounting for more than 30 percent of all mobile spam. The iMessage system is so popular because it’s free and incredibly easy to use – all the spammers need to use it is a valid email address. Apple recently added a rate-limiting feature to iMessage, reducing the number of messages these spammers can send. But at the same time, Apple’s mechanism to report spammers is burdensome, and the company has been slow to respond to the few reports that do come in. Thankfully, you can reduce the level of nuisance by turning off iMessage alerts from addresses that aren’t in your contacts. You’ll still get the messages, but they won’t cause your phone to sound or vibrate and you won’t have to deal with alerts. 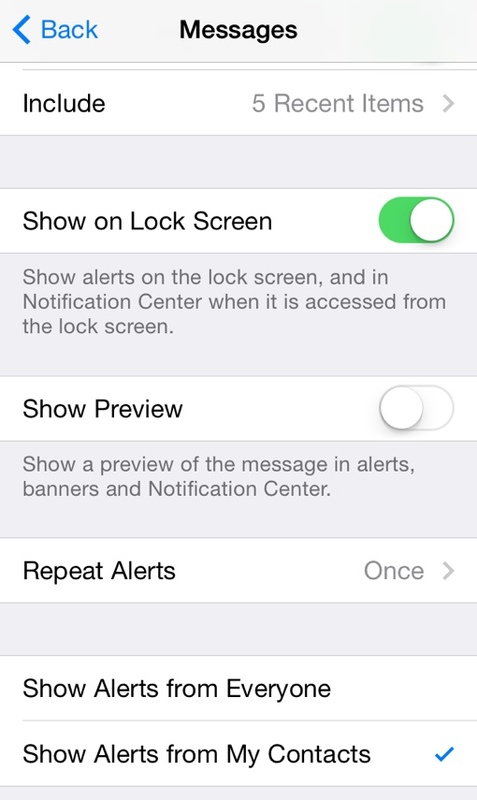 Simply visit your Settings > Notification Center > Messages > Show Alerts from my Contacts, as shown. Looking for more ways to stop mobile spam? Check out these other tools for blocking telemarketers on your smartphone, and be sure to take a look at our need-to-know mobile security guide for more general tips and tricks.